I thought this a good time to post my currently unfinished, ugly guide with lots of boring info. Experienced players don’t have to read, unless you want to help me! Dedicated to Schwan. He will live forever in our hearts. This here is a work-in-progress, it is not done. I welcome your criticism, contributions, or suggestions. I’ll probably forget some things, since I have a really really bad memory. I’m no artist, and this thing is really ugly, so suggestions on that would be appreciated. Suggestions on everything will be appreciated. Of course, anyone that contributes will be acknowledged, and people who contribute a lot will be acknowledged a lot. Not that it’s bad, it’s just out-of-date and doesn’t have the new things that were added. This guide is basically a bunch of info in one place. It will include a walkthrough-like thing too. Right when you make your account, you have a very important choice to make: Which Civilization (Civ) you’re going to join. There’s four choices: China, Egypt, Persia, and Rome. 1. Cho Ku No are the best archers and level-ers in the game. Meaning, they’re best against monsters. They have a really fast attack rate. 2. You can get to Japan, the Bering Strait, and Australia easier for more territory (usually undisputed). 3. Silk is great for trading. 4. China’s Units have a fast attack speed. 5. Defense bonus is cool! 1. Chariots have range of 1-7 and power of cav, and can outrun pikes. 2. T5 pikes can counter other Civ’s Cav. Chariot/Pike is a good combo. 5. It will be hard for China to plunder you until they get a CZ near you. 1. In the middle of map, so easily PvP with people, easily get access to World Map monsters. 2. Persian troops have relatively high attack. 3. Persia gets an attack bonus. On the left top side you have your resource information. The 5 resources are Food, Wood, Stone, Metal, and Gold. It shows how much of each resource you have. Place your mouse over the number to find out additional information about your resources. 1) Total Production – How many resources you get per hour, everything else added together. 2) Basic Production – how many resources you get from your mines. 6) Country Bonus – When a Civ owns CZs, they get a Resource Bonus depending on the number of CZs they own. This percentage is a percentage of the basic production. The more CZs, the higher the bonus. 9) Soldier Consumption – The amount of food Soldiers eat, is a negative number and decreases food production. Only applicable to food. When your food runs out, some Soldiers will disappear. The amount of food consumed by each soldier depends on the level of the soldiers and what type they are. Wood, stone and metal are needed to upgrade buildings, do researches, and train soldiers. Gold is needed to train soldiers, upgrade guild, and to research. Under the resource information is a portrait of you and a bunch of buttons. If your portrait is flashing red, you are being attacked or scouted. Achievements are basically notable Achievements. There’s no benefits, only for making you feel good. Talents are like skills your hero/missionary/merchant/soldiers can learn that give them bonuses. They require carnage to unlock. The “Player Info” button gives you an overview of your city and account information, not very hard to grasp. The question mark gets you to the helpdesk. There are also pictures to the right. One picture shows if you’re in Newbie Protection or not. If you don’t have this button, you aren’t in Newbie Protection. Another shows your Country resource bonus. If you don’t have this, your bonus is 0%. Another shows the territory bonus. You need 1000 territory for the maximum bonus, which is your Civ’s special bonus. There’s the shop button, which gets you in the MoW shop. You can get more points and buy stuff here for a fixed price. There’s the Auction button, which gets you in the Auction House (AH). Players sell equips, skills, and exp balls for point vouchers (different from regular points). Players set the prices, players buy or bid. You can bid, which means you select how much vouchers you want to pay. If you win the “bidding war”, you get the item. If you lose, you get refunded. You must pay greater than the listed “Bid” price. If you buy an item, you pay the price, nothing special. There’s a 10% tax, but they round down. Example, you sell something for 19 points, they have a tax of 1, not 1.9 or 2. Selling stuff requires gold. Items are taken off the AH after a set amount of time, which you can make longer by using more gold. There’s the CZ button, which let’s you see declarations on CZs involving your Civ. At the top-middle of your screen there are 2 small buttons. 1) A Green Arrow – Age Evolution button. This opens a window that allows you to evolve, and shows you the requirements you must fufill to evolve to the next age. 2) A Flag with an “A” – Toggles the building, mob, and hero names. If it’s on, you will the the name and level of things, such as buildings, World Map mobs, heroes, cities, etc. If it’s off, you will not be able to see these labels. There’s also something that shows which Age you’re in. To the left and right are some small buttons. 1) Event – Unique Tasks. You get rewards when you evolve to another Age, or upgrade Hero Monument. 4) Rank – Rankings. There’s Player, Guild, Arena, and Hero rankings. Player rankings include Carnage, Territory, Glory, Spirituality, Gold, Battles won, and Total Battles. Guild rankings have Territory, Members, and Level ranks. Arena Ranks include Total Battles, Victories, and win streaks. Hero ranks include Heroes, Missionaries, and Merchants. 5) Mail – Send/Receive Mail. Make sure you don’t delete mails with attachments! 6) Options – Sounds, Assistants, and refreshing! 1) Loyalty – Measure of how much the people of your city “love you.” Less loyalty means lower resource production. There are 3 levels of loyalty: Green, Yellow and Red. Green is the best. Increase loyalty by building, researching non-Military Armory skills, and donating. Decrease loyalty by recruiting soldiers, researching non-Military Armory skills, and getting attacked. 4) Territory – The amount of squares of land under your control. You can get Civ bonuses from having more territory. 5) Population – The amount of people working in your city. Besides workers in buildings, Soldiers also take up population. Build houses to increase population (maximum is 20,000 population). You also have a little menu thingy that shows what you’re building, recruiting, and/or researching, how long it’ll take, what type of item you’re using, and the time till the items’ effect runs out. Levers of Fortune – You can get free stuff from here. In total, you get two free things per try: a Tavern Refresh and something else. That something else includes Resources and Shop items. You can also get a Purple Hero from Levers, but there’s a low probability of you getting one when there are a lot of lever-ball-egg things left. Yellow and Orange give low level Purples, while Purple and Blue give higher level Purple Heroes. Their stats are randomly allocated. At the left of your screen is is the Chat. The chat has 5 tabs: All, Guild, Civ, Private, and Help. You can choose what channel you want to type in with the little drop-down thingy on the left of the typing box. Guild, Private, Civilization, Trumpet, Direction, and Help. ‘Guild’ is a channel only your guild can see. ‘Private’ is a chat between 2 players. ‘Civilization’ is a channel that everyone in your civ can see. You can only use the Trumpet chat if you have the “Trumpet” item, and everyone can see what you type if you use a trumpet. Direction is a chat for Novice Guides/MoW Knights. Help is the GM channel. There is an about 1-2 second cooldown for chatting. The buttons at the bottom left corner of the chat box let you lock the chat, meaning that the chat box won’t automatically go down to the bottom and close the chat box. You can reopen it easily though. The button in the top right lets you enlarge or reduce the size of the chat box. If you click peoples’ names on chat you get a bunch of options. Send Mail – Send a mail! Ignore – Makes it so you can’t see anything the person says. On the right of the screen is the little panel that shows Cities, Heroes, Missionaries, and Merchants. There are 4 little tabs that let you choose if you’re going to be viewing your Cities, Heroes, Missionaries, or Merchants. You see a little pictures of your Cities, Heroes, Missionaries, and Merchants on each tab, followed by their names. To select them, click their picture, and you get some options. 1) Cities – This shows the cities you have, as well as their names. If you click on the picture, you can either “Check” or “Locate”. If you click “Check”, you go inside that City. If you click “Locate”, you go to the City’s location on the World Map. 2) Heroes – This show the heroes you have, their names, and the heroes color. If you click on the picture, you can either “Check”, “Locate”, “Halt”, “Recall Hero”, “Garrison”, “Arrange”, or “Battle”. If you click “Check”, the Hero Information Menu pops up. This will be discussed in the “Heroes” section. If you click “Location”, you find the hero’s position. If you click “Halt”, the hero stops traveling. If you click “Recall Hero”, the hero comes back to the city/camp from where it left. If you click “Garrison”, it’s as if you clicked the City Defense Office and then Garrison. You can Garrison your heroes, which means they’re attacked if someone tries to plunder you. If you click “Arrange”, you can arrange the troops that your hero is leading. If the hero is in the city, you can place troops back into the city, or put troops on the hero. If you click “Battle”, you can rejoin a battle you left. This is only able to be used when your hero is actually battling something. 3) Missionaries – You can either “View”, “Locate”, or “Recall” the Missionary. If you click “View”, you open up the Missionary Information Menu, which will be explained in the Missionary Section. If you click “Locate”, you find the Missionary’s position. If you click “Recall”, the Missionary will come back to the city. 4) Merchants – You can either “View”, “Locate”, or “Recall”. If you click “Check”, you open the Merchant Information Menu, which will be explained in the Merchant section. If you click “Locate”, you find the Merchant’s position on the World Map. If you click “Recall”, the Merchant will come back to the city. You cannot stop the Merchant after it recalls. There are two layers of buttons on the bottom. The first layer has 4 things you can click, the second layer has 7 buttons. Layer 1 contains figurines of things that you can click. If you hold your mouse over these things, the names will pop up. 1) Build – Transports you to the City view, where you can see buildings such as the Town Center. 2) Foreign Trade – The Trade Post window will pop up. The Trade Post building will be explained in the Buildings section. 3) Prayer – The “City” window will pop up. When I say City, I mean the building where you pray in. The City will be explained in the buildings section. 4) War Room – A window pops up which has multiple tabs. –1. 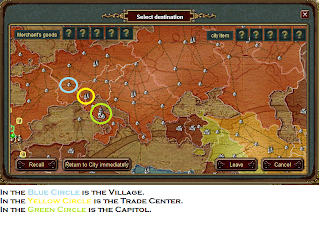 World NPC – simply locates World NPCs around the place you click on the map to the right. You can choose which level World NPCs you want to search. –2. Lairs – Finds lairs near the area you selected on the map. You can choose the level of Lairs displayed. –3. Plunder – Finds Plunder Targets around the area you selected on the map to the right. You can choose the Age of people displayed. For more info on Plundering, see the Plunder section in PvP. –4. Siege – Finds Siege targets. You can choose the Age of players displayed. For more information of Sieging, go to the Siege section in PvP. 1) City – Donate (for loyalty), Tavern, Task menu. 2) Research – Hero (Hero Academy), Troops (Military Armory), Resource (Research Academy), Holy Site (Civic Center). 3) Military – Recall (From Region), Return to City (From World), Assign (Assigning troops), Garrison (Garrisoning Heroes). 4) Recruit – Barracks, Archery, Stables, Arsenal, Castle. 6) Service – Event (Unique Tasks), Store (shop), Top-up (Put points into your account), Website (http://www.ministryofwar.com), Forums. In the City, you can recruit soldiers, hire heroes, worship, and build buildings. Right smack dab in the middle is where you put your buildings. Kind of obvious. Palace – Enter Palace, where you get Main Tasks from your 4 advisors. Guild – Opens Guild Menu. More information in the guild section. Inventory – Your stuff. Items, equips, Merchant items (sellable). Event Information – Stuff that happens. Battles, scout reports, moving merchants, worship, etc. Tasks – Accept and Finish tasks for resources and fame. There are 3 types of tasks. There are Main tasks, which leads you through the game process and may give you some gold, equips, and skill rewards. There are Growth tasks, which are just “upgrade building/research/hero, here’s some resources” tasks. Finally, there are Daily tasks, which can only be done once a day. They give you gold and some items. Friends – See your friend list. You can see when your friend logs on or when they are on. There’s also the ignore tab, which is a list of people you ignore from chat. World Map – See the ENTIRE world map. Build Buildings. If you can’t build anymore, you can’t press it. Sees troops in City. If you have no troops in selected city, you can’t press it. Arena – Click this button to enter the Arena menu. More info in the Arena section. Arcadian Ladder – Enters a hero into the Arcadian Ladder, an instance with 50 battles, 5 levels with 9 regular battles and 1 boss battle per level. More Info in Arcadian Ladder section. Next to the tabs is the “Hall” button. Click it to go into your hall. In the bottom-right, you have 3 buttons and a minimap. Show Entire World Map – Shows the big world map. Show available Construction PlotsShows 2×2 Squares on the world map. Only usable on World View. Saved Coordinates – Self Explanatory. City List – Shows list of CZs, Trade Centers, and Capitals. Filterable. Minimap – In the city view, it shows where buildings are. In the Region view, it shows where buildings are, and where mobs are. Mobs are represented as red triangles at the Region view. In the World view, it shows where other cities are, and where temples are. Temples are red triangles. Your city is a blue square. The Region is a small area arround your city. You can build Resource Mines and hunt level 1-30 mobs here. It’s like a “training area”. The World view is where you can see other peoples’ cities, attack high level NPCs and lairs, trade with Merchants, expand your territory, tax people, and collect at collection points. The screen of the World view is the same as the screen of the Region and City views, except for the middle, where everything happens. In the middle of the screen, you can see the environment, the great outdoors of the MoW world, where you can interact with other players, gain territory, and trade stuff. In the top right, there is this compass. Click the direction (North, East, etc) to move the map. You can also click and drag, which is faster. In the middle of the compass is a magnifying glass, which opens the “Find” menu. This Find menu searches the world map and finds the closest monsters/lairs to your current location. It is filterable. On top of the compass is three buttons. In Savage Age, the 1st Age, you can build the Town Center, the Warehouse, the Tavern, the Research Academy, Barracks, and Civilian Houses. A special building is the hero monument, which costs 100k gold. If you don’t build a lvl 1 hero monument in Savage Age, you need to buy a card to build it in a higher age. You can recruit T1 Peltasts. You have beginner’s protection when in Savage Age. In the Dark Age, the 2nd Age, you can build the Archery Range, Military Armory, City Defense Office, the City, and Walls/Gates/Towers. You can recruit T2 Peltasts, T2 Archers, and T2 Pikemen. You need 600 glory, and a level 10 hero to evolve to Dark Age. In Feudal Age, the 3rd Age, you can build the Stables, Trade Post, and Civic Center. You can recruit T3 Peltasts, T3 Archers, T3 Pikemen, and T2 Cavalry. You need 2,500 glory, 200 Spirituality in your City, and a level 20 hero to evolve to Feudal Age. In Castle Age, the 4th Age, you can build the Arsenal and Hero Academy. You can recruit T4 Peltasts, T4 Archers, T4 Pikemen, T3 Cavalry, T2 Giant Crossbowmen, and T2 Ballista. You need 10,000 glory, 1200 Spirituality in your City, a level 10 Merchant, and a level 40 hero. Empire Age people can plunder Castle Age people in the same Civ, and vice versa. In Empire Age, the 5th Age, you can build the Castle. You can recruit T4 Peltasts, T4 Archers, T4 Pikemen, T4 Cavalry, T4 Giant Crossbowmen, T4 Ballista, and your country’s special T5 units. You need 40,000 glory, 4800 spirituality in your City, a level 30 merchant, and a level 60 hero. Empire Age people can plunder Castle Age people in the same Civ, and vice versa. Contested Zones (CZs) are zones on the big World Map that start out neutral, but can be taken over my guilds. There are 54 in total. Special ones are Vallata, Ha’li, and Tuymazy, which have horse thieves (lvl 70+ mobs). First, your guild must have at least 10 members and 50k total guild glory. If you fulfill these conditions, your guild leader, or whoever the guild leader gives authority to, can declare war on the Contested City in a CZ. You can only declare war on CZs that are touching your Civ’s CZs or Territories. There are a bunch of arrows on the map that show which CZs you can attack when you don’t have a CZ touching it. For example: You can attack Tripoli from Smyrna, and vice versa, even though they are separated by a sea. NOTE: There are a few bugs. You can’t attack Megion from China, even though it looks like they’re touching. During CZ battle times, you can attack the Contested City. CZ battle times are at 6-9PM PST (GMT-8) on weekdays, and 10AM-1PM PST on weekends. More information on CZ battles can be found in the Battles section [BTLCZ]. NOTE: You can get people from your own Civ to defend you camp. They enter using the “Help Defend” button. NOTE: You can’t capture camps anymore, you can only destroy them. If I get permission, I’ll post the whole thing here. First, make sure your Civ has a CZ. You can only teleport to your Civ’s CZ. Then, click the CZ teleport button. After the Teleporting Menu pops up, select the Contested City you want to teleport to, the hero you want to be teleported, and the amount of food you want you hero to bring. When you’re all done choosing, you can press the “traveling on a long journey” button on the bottom to teleport. When you want to teleport back to your main city, Garrison your hero in any Contested City by clicking the Contested City, clicking the Contested City, clicking “Garrison”, clicking “Rally”, selecting your hero, and clicking “Garrison the City”. After the hero is Garrisoned, click the Contested City, click “Garrison”, select your hero, and press “Return to country”. Your hero will be instantly transported back to your Main City. To teleport from a Camp to a CZ, go inside of your camp, then press the CZ teleport button. Even if your hero comes from a Camp, it will still teleport back to your Main City if you recall your hero through CZs. Only heroes can teleport to a CZ, not a missionary, not a Merchant. Here’s a list of all buildings. Maximum level of buildings is 20. Town Center – Required to build and upgrade other buildings. A high level Town Center level increases gold output. Warehouse – The higher the level, the more resources you are able to hold. Tavern – The place where you hire Heroes, Missionaries, and merchants. A high level Tavern gives you a better chance of getting a higher quality Hero, Missionary, or Merchant. Market – Needed to trade one resource for another. Higher level means a better exchange rate. Only every four levels is there a change in exchange rate. Civilian House – Increases the maximum population of a city. Each house’s max population caps at 2000 population per house at level 10. You can have a total of 10 Civilian Houses, meaning that the maximum population for your city will be 20,000 when each house is level 10. Barracks – Needed to train melee soldiers. A higher level barrack decreases the training time for melee soldiers. Research Academy – You can research Production Skills here. NOTICE:Hero Monument – You can only build Hero monument level 1 in Savage Age, level 2 in the Dark Age, etc. If you didn’t build level 1 in Savage Age, you can’t build level 2 (unless you have the card). The hero monument can give free ranged T5, but uses a lot of gold. 100k gold in Savage Age, 1 mil gold in Dark Age, 2 mil gold in feudal age, etc. City Defense Office – Needed to garrison troops. The garrisoned troops defend your city even if you are offline. More than one hero can be garrisoned. Holy Place – You can worship in here. Worshipping raises your spirituality value and can give you territory. The amount of territory you get is limited by your sphere of influence. Maximum spirituality in the City is 9999. This building is needed to make Temples. Archery Range – Needed to train ranged troops. A higher level Ar[/b]chery Range decreases the training time for ranged units. Military Armory – You can research Military Skills here. Trade Post – Needed to send out Merchants to trade. No apparent benefit for a higher level. Stable – Needed to train Cavalry. A higher level Stable decreases the training time for Cavalry. Civic Center – You can research Culture Skills here. Arsenal – Needed to train Trebuchet and Giant Crossbowmen. A higher level Arsenal decreases the training time for Trebuchet and Giant Crossbowmen. Hero Academy – You can research Hero Skills that improve your hero’s stats here. Castle – A Castle is needed to train T5 units, the units unique to each country. A higher level Castle decreases the training time for its unique units. You can recruit Heroes in your Tavern. Every hour, the tavern refreshes, but you have to look into the tavern to make it refresh. Meaning, the timer will count down again once you click it. This way, you don’t miss any good heroes, but it may take more time to get a good hero. A higher level tavern gives more heroes per refresh. Whether or not a higher level tavern has a higher chance per slot for a better hero, or each slot has the same chance for a better hero has not been tested or confirmed. WHITE, GREEN, BLUE, and PURPLE. White is the worst and Purple is the best. The better color, the more increase in attribute points a hero gets every time he/she levels up. That is a big difference for higher lvl heroes. When a White hero levels up, he/she only gets 4 attribute points for you to add. A Blue hero, on the other hand, gets 8 attribute points for you to manually add per level up. Your starter Blue hero only gets 7 attribute points per level up though. NOTE: Orange Heroes are a myth, do not believe anyone who says that there are orange heroes. The starting stats of a hero, all the 4 attributes will be random. I believe minimum for each attribute is 9 (that’s the lowest I saw so far) and the maximum seems to be 99 (the highest I saw was 92, I’m guessing 99 is rare). Usually, one stat may be high, while the other stats will be lower. Your starter Blue Hero cannot be deleted, and only gets 7 points per level up, making it a green/blue combo. Inferior to regular blues, better than regular greens. The basics are covered in the tutorial. Equip items on your hero, Assign Troops to your hero, and you’re ready to fight. Fighting is the main use of heroes. You can use heroes to collect at collection points, scout, and move units/resources around, but their main use is fighting. You can see this when you click your hero’s picture, and click “View”. You can equip items, learn skills, heal your hero, see your hero’s stats, and see how much soldiers he has. On the left, you see a big picture of your hero, the equipment he/she’s wearing surrounding the picture, and a list of your heroes. Click a name on that list to go to that Hero’s Info. The “Attribute” tab shows the hero’s stats. Including his/her Name, level, exp gained, exp needed to level up, HP, MP, Attack, Defense, Maximum # of soldiers, and how well your hero can handle “Internal Affairs” (not implemented yet). You can heal your hero by pressing the + next to your hero’s HP and MP. You can Rename, Dismiss, and use a Hero Restoration Medal here. The “Inventory” tab shows items in the inventory that are equipped on a hero. You can learn skills here, as well as equip equipment and potions. The “Units” tab shows the soldiers assigned to your hero. It also shows the resources on your hero. A hero can carry maximum 8 stacks of soldier. Each stack can have up to 600 soldiers. Assign by clicking on a stack of soldiers, then clicking on the target square. Select the amount of soldiers, and click confirm. There are 4 attributes for a Hero: Power, Command, Physique/Constitution, and Intelligence. Command – Increases the amount of soldiers a Hero can hold by 2 soldiers per point. Internal affairs is not implemented yet, or is unknown to me. Click your Hero, and click check to get to the Hero management screen. On the left you see the the equipment your Hero’s wearing all around your Hero’s picture. Go to the inventory tab on the right. There are 10 types of equipment, and 3 general categories. Weapons – They increase your Hero’s attack power. Each weapon has a damage per second (dps). Higher dps is good. Faster att speed is good if your target is staying still. Higher att power is good if your enemy is prone to running around. Hero equipments have some bonuses to Heroes and/or troops. For example, I have this equipment that gives +12 Hero Power (Hero bonus), and +2 HP for T3 Cav (Troop Bonus). A feature of Hero Gear is Durability. Basically, if you use your Gear too much, it’ll get older and badder. Equipment starts out with 100/100 durability. When it goes down to 0/100, the equipment becomes red. This means that the items effects (+HP, +def, etc) aren’t working. You can repair the gear if you pay a certain amount of gold. How much gold you pay depends on the level of the gear and the amount of durability lost. Set items are very useful. They come in a set, as the name implies, and if your hero is wearing a few items from this set, they would get an additional bonus. At the bottom of the set item description, you can see how many items from the set are needed to get the bonus, which is also listed at the bottom of the item description. They also give a bonus to a specific stat. For example, the “Hi-quality Black Dragon” set increases power. All “Hi-quality Black Dragon” pieces increase power, but these sets require a certain amount of power to use. Currently, if you put all command in your hero to wear command gear, then used a refresh medal to put all power in your hero, the command gear will become red if you don’t have enough of the Command stat. You can show off items by holding the “Control” button and clicking the picture of your item. It will be in the chat menu, and you can show it off on chat. You can also equip your hero with Battlefield HP/MP potions in the Misc. section. MP and HP are restored over time, but potions give you HP/MP during battle. When not in battles, you can use the other type of potions, which can instantly give you HP/MP. In the battle, use skills by selecting your hero and clicking the skill. You can equip a maximum of 6 skills per hero. Slowing-Down skills can slow down or stop heroes or soldiers. These include Assassin’s Vine, Mud Trap, and Quicksand. Targeting skills do damage to one solider/hero. These include skills such as Shock Assault, Fan of Knives, or Knife Breaker. AoE skills deal a certain amount of damage to all soldiers/heroes around your hero and in range. These skills include Flood and Pyromania. Enhancement skills will increase the speed of attack, movement speed, strength of attack, or defense of heroes/soldiers. These skills include Focus, Stampede, Sprint, and Overwhelming Force. When using a skill, you must have the required amount of Power, Command, Constitution, or Intelligence for the skill to work. For Example, if you have a skill that requires 185 power to learn, but got around that with a restoration medal and now your hero has 40 power, your hero will be unable to use that skill. When your hero has more of a stat, the skill will be more effective. For example, a hero with greater Intelligence will do more damage with the Flood skill than a hero with low Intelligence because Flood is an Intelligence skill. When you unlearn a skill, the skill is deleted. You recruit missionaries in a Tavern. You must build a Holy Place (available in Dark Age) to recruit missionaries. The colors of Missionaries mean the same thing as the colors of heroes (see [HROC], the Hero color section). Missionaries deal with all things religious and territory related. There are 4 types of Attributes for Missionaries. They are Prayer, Conversion, Demoralization, Piety. Prayer increases the rate at which spirituality is gained in a temple/Holy Place. Demoralization makes the missionary better suited for defaming other temples/Holy Places. Piety makes the temple the missionary is in lose less spirituality from other people defaming. You can do four things with Missionaries: Defame, Worship, Dispell, or Missionize. Defaming will lower the spirituality in the enemy temple. Click a temple/city and select “Slander” to defame. This is influenced by the demoralization attribute. Worshipping with Missionaries will give increased benefit to the temple/Holy City. Examples include faster rate of spirituality gain (Prayer stat), bigger range (Conversion Stat), and losing spirituality at a slower rate when defamed (Piety stat). You must assign missionaries to the temple/Holy city for the effect to take place. See the Temple section [TRTT] for more info. Dispelling is basically attempting to send an enemy missionary back to its city. You click the enemy missionary, click “Dispell”, and select a missionary. If the missionary succeeds, the enemy missionary will leave. If it fails, nothing changes. I DO NOT KNOW WHAT INFLUENCES EFFECTIVENESS OF DISPELLING. ANYONE WANT TO SHARE? Missionizing will simply give your missionary experience. I DO NOT BELIEVE THERE ARE OTHER BENEFITS. IF YOU KNOW OF ANOTHER BENEFIT, PLEASE SHARE? Merchants are the money makers. They trade goods for the purpose of making a profit. There are four Merchant attributes: Capacity, Speed, Persuasion, and Charm. Capacity will increase the weight able to be carried by the Merchant. The formula is: 10,000 + (Capacity stat * 5). Each good has its own weight. If your merchant can carry 12000 weight, then he/she can carry 12 western swords, which have a weight of 1000. Persuasion will increase the selling price of goods. Charm will supposedly “increase the amount of goods able to be bought”. However, it does nothing. First, the main purpose of Merchants is to make gold. After building a trade post and recruiting a merchant, you must send the merchant off to trade. Do this by clicking the Trade Post, selecting the merchant you want to send, determining the amount of gold to load onto your merchant near the bottom of the trade post menu (don’t forget to actually load the gold), and then pressing the “Leave” button. Select your destination and press the other “Leave” button. Note: The higher the level, the farther the merchant can travel at one time. Example: At levels 1-9, a merchant can travel to one village at a time. They must stop at every village. At levels 10-19, a merchant can travel two villages at a time. Instead of hopping on one-village trips, you can effectively “skip” a village and proceed directly to the next, farther village. See the Merchant Leveling Guide [MCHLG] to find out how to make a profit and level up merchants. The best goods to buy are goods with a high price/weight ratio, such as Silk (18/1), Western Swords (18/1), Aromatic Essence (18/1), Water Buffalo (17/1), and the numerous 16.5/1 and 16/1 products. The more profit you make on a merchant the more experience you get for that merchant. First step is to click on your Trade Post and add items and/or gold. Items you can receive from the collection point and defeating various world mobs and lairs. After you have added items and/or gold you should click the “Leave” button. Once you leave you need to get to a Trade Center to be able to sell. You can buy at villages but not sell. Some people say that shorter distances work better because it is faster while others say that it’s more profit longer distances. A long route that I see most people using is Rome where you buy Western Swords then head to Babylon (Persia) and buy Water Buffalo followed with the last destination as Changan (China) to buy Silk and return to Rome. You can look for the route that suits you the best.